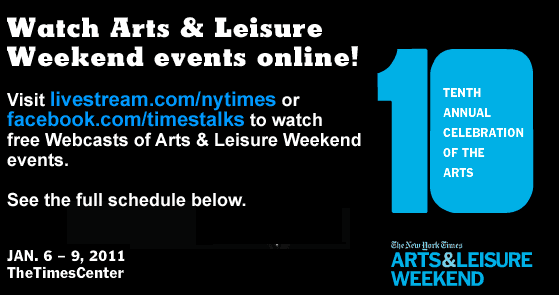 The New York Times Series for Arts and Leisure is celebrating its 10th anniversary this 2011; and the line up is packed with a variation of impressive talents. Musicians such as Trent Reznor and Billie Joe Armstong and actress Michelle Williams are joined by legends such as Robert Redford and Annie Proulx. The set-up of the talk is very simple: There's an interviewer (usually by a NY Times writer or editor), joined by the talent. The questions usually start off with the interviewee's disambiguation of hers/his current project, followed by a chronological descending order of works, leading up to how their career began, going over methods, their creative process, and finally a Q&A with the audience to sum up the interview. It's all very Actor's Studio-esque kind of scenario--quite serious, yet inspiring and informative. (See full schedule below after the jump). This year, the Times doesn't fall short on its technology side: It continues to stay ahead of the new media game--offering up free webcasts for the entire series. So if you're disappointed because the talk you want to see is already sold out, or you simply can't be in New York to attend, this could certainly take the ultimate tech consolation prize. But if you are in the city, we highly recommend getting tickets if they're still available, it's definitely an underrated way of getting know someone you've been applauding from afar. The two-time Academy Award–winning actor-director-producer is currently starring as disgraced former lobbyist Jack Abramoff in “Casino Jack” as well as serving as creative director of the Old Vic theater in London. Interviewed by Frank Bruni. Five years ago, the anchor and managing editor of the “CBS Evening News,” made history by becoming the first female solo anchor of a weekday network evening news broadcast. Interviewed by Gail Collins. The Nine Inch Nails mastermind and composer talks about his career and creating the music that plays such a crucial role in “The Social Network.” Interviewed by Jon Pareles. The author of “The Shipping News,” “Close Range” and “Brokeback Mountain” is the winner of both a Pulitzer Prize and a National Book Award. Her latest book is “Bird Cloud,” a memoir. Interviewed by Patricia Cohen. The legendary Academy Award–winning actor-director-producer discusses his career, his latest film, “The Conspirator” and his leadership of the Sundance Institute. Interviewed by Janet Maslin. Host of the Food Network’s “Barefoot Contessa: Back to Basics,” food entrepreneur, cookbook author and magazine columnist, she has been a forerunner in the food world for more than 30 years. Interviewed by Alex Witchel. The brother and sister singers-songwriters-musicians talk about their music and lives and perform together on our stage. Moderated by Melena Ryzik. The New York Times crossword editor, best-selling author and the subject of the documentary “Wordplay” brings the puzzles center stage. The Oscar-nominated star of “Blue Valentine” talks about her new film, her career and what’s in store for the future. Interviewed by Dave Itzkoff. The 28-year-old superstar classical pianist has played to sold-out audiences throughout the world, including the New York Philharmonic on New Year’s Eve 2010. Interviewed byJames Barron. Terence Winter, the co-creator of the new HBO series and Emmy Award-winning writer of “The Sopranos,” joins “Boardwalk Empire” cast members Steve Buscemi, Michael Shannon and Paz de la Huerta. Moderated by Charles McGrath. Celebrating 40 years of conducting the Met in 2011, he has developed the opera to an unparalleled level of achievement. Interviewed by Daniel Wakin. The vocalist/guitarist of Green Day and the director who co-wrote the Tony Award–winning Broadway musical “American Idiot” with him are joined by the show’s Tony Award–winning star, singer-songwriter John Gallagher Jr. Moderated byPatrick Healy.